Carte des Côtes de France & dEspagne [Map of the coasts of France & Spain]. Antique copperplate map, 1747. Title of map:’Carte des Côtes de France & dEspagne [Map of the coasts of France & Spain]. The image below shows an enlarged cross section from the centre of the map to show the level of printed detail. This map is folding hence the centrefold line may show on the image below. France & Spain on the méridien de Ferro. IMAGE SIZE: Approx 24.0 x 28.0cm, 9.5 x 11 inches (Large); Please note that this is a folding map. ARTIST/CARTOGRAPHER/ENGRAVER: Jakob van der Schley & Jacques Nicolas Bellin. PROVENANCE: “Histoire Générale des Voyages, ou nouvelle collection de toutes les relations de voyages par mer et par terre”, nouvelle edition dont les figures & les cartes ont été gravées par & sous le direction de J. Vander Schley, elève distingué du célèbre Picart Le Romain. A La Haye, Chez Pierre de Hondt, avec Privilége de sa Majesté Impériale & de Nos Seignuers les Etats de Hollande & de West-Frise. TYPE: Antique copperplate map. VERSO: There is nothing printed on the reverse side, which is plain. CONDITION: Good; suitable for framing. However, please note: Light spotting. Neatly repaired marginal tear. Virtually all antiquarian maps and prints are subject to some normal aging due to use and time which is not obtrusive unless otherwise stated. AUTHENTICITY: This is an authentic historic print, published at the date stated above. I do not offer reproductions. It is not a modern copy. The term’original’ when applied to a print means that it was printed at the first or original date of publication; it does not imply that the item is unique. Print’ means any image created by applying an inked block to paper or card under pressure by any method including wood engraving, steel engraving, copperplate, wood cut and lithography. REMARKS: FRANCE: Gravures et Cartes anciennes. DEUTSCHLAND: Alte Lankarten und Stadt ansichten. ITALIA: Stampe e Mappe antiche. ESPAÑA: Mapas antiquos y impresiones antiguas. English law shall apply. The item “Carte des Côtes de France & dEspagne. 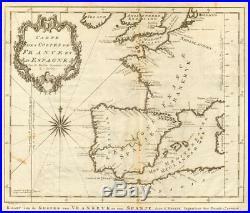 France Spain coast BELLIN/SCHLEY 1747 map” is in sale since Saturday, January 19, 2019. This item is in the category “Art\Art Prints”. The seller is “richben1066″ and is located in London. This item can be shipped worldwide.